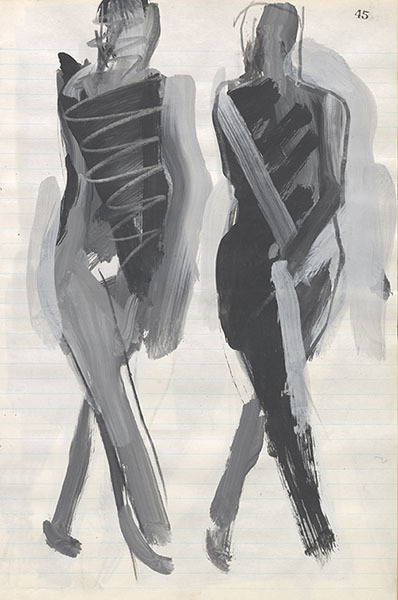 The exhibition Manuel Neri: The Human Figure in Plaster and on Paper explores the artist’s tireless fascination with the human form, drawing from a recent gift to the Gallery of more than 150 sculptures and works on paper from The Manuel Neri Trust. A contemporary of other notable California-based artists such as Elmer Bischoff, Joan Brown, Richard Diebenkorn, David Park, and Wayne Thiebaud, Manuel Neri (b. 1930) is best known for his life-size sculptures that combine classical figuration with the dynamic mark making of Abstract Expressionism. 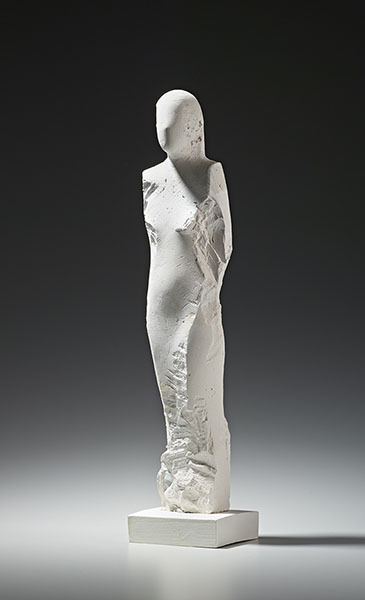 Neri’s engagement with the accessible and inexpensive materials of plaster and paper began in his early days as an art student of the 1950s and ever since has inspired an incredible proliferation of sculptures, drawings, watercolors, and more. The artist has a unique and visceral method of working that is most visible in his plaster pieces, which he builds up roughly with bare his hands over homemade armatures made of scrap materials. 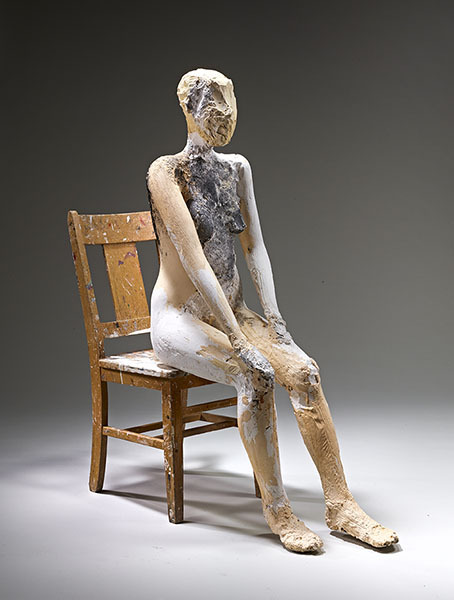 He alters many of his sculptures once they have dried, snapping off limbs or reworking the surface with pigments and tools—sometimes over the course of decades. Jock Reynolds, the Gallery’s Henry J. Heinz II Director—who observed Neri’s studio process firsthand as his student and teaching assistant at the University of California, Davis—curates the exhibition, paying homage to his former teacher and mentor. In 1975, shortly after Reynolds left UC Davis to begin his own career as an artist and teacher, he cofounded 80 Langton Street, an alternative artists’ space in San Francisco. It was there, one year later, that Reynolds invited Neri to create a sculptural figure in plaster every day for a little more than a week, resulting in an installation of eight figures surrounded by the debris and tools that accompanied their making. The exhibition came to be titled The Remaking of Mary Julia: Sculpture in Process, named for Mary Julia Raahauge, who was Neri’s great muse at the time. Now, more than forty years later, and upon the culmination of a twenty-year directorship at the Gallery, Reynolds again puts the talents of his former mentor on display, with a solo exhibition of 29 sculptures and 11 works on paper. This engaging publication examines the prodigious body of work of American sculptor Manuel Neri (b. 1930) through the unique perspective of one of Neri’s former students. A near-contemporary of other notable California-based artists Richard Diebenkorn and Wayne Thiebaud, Neri is best known for his large-scale figurative sculptures that combine classical figuration with the dynamic mark making of Abstract Expressionism. The book traces the compelling yet often contradictory thematic arcs of Neri’s powerful work and his greater impact on the field of sculpture. At the heart of the publication are Jock Reynolds’s personal reflections on Neri and his legacy as a teacher, adding insight and intimacy to the scholarly understanding of the artist. Photographs of Neri in his studio, archival images, and installation photographs of the related exhibition at the Yale University Art Gallery round out the book. With its blend of art history and personal reflection, this unique book offers valuable insight into an important, understudied California artist. Exhibition organized by Jock Reynolds, the Henry J. Heinz II Director. Made possible by the Joann and Gifford Phillips, Class of 1942, Fund; the Raymond and Helen Runnells DuBois Publication Fund; the Rosalee and David McCullough Family Fund; the Stephen S. Lash Fund; and the Wolfe Family Exhibition and Publication Fund.